Right down the street from where I lived was a tiny, taupe elementary school sweetly nestled next to a convenience store and a beloved grocery store. Tucked in between the worn hurricane fence and the textured brick façade of the school was a small, modest plot of dirt where Mrs. Benoit’s 2nd grade class were to conduct very important physical science experiments. The entire group marched outside onto the magically damp, dark chocolate lot. We fashioned furrows with our hands, gently created holes with our index fingers and dropped tiny seeds into the hollows. We covered them with mossy, murky soil, gave them a drink and hoped they slept tight under the soil and not to let the bedbugs bite. Daily during recess, I took a quick peak at the petite garden. My heart filled with delight as I began seeing little sprigs of green hairs and emerald leaves peaking through the soil and stretching out in the sunlight like a small child awakening after a midafternoon nap. Then, on one bright and sunny day, Mrs. Benoit told us to retreat to our adored garden we had been tending to for quite some time now. She handed out little shovels and gardening gloves and directed us on how to tend each row of veggies. I was assigned to a short row of mysterious emerald fronds while the rest began plucking beautiful vibrant green cucumbers and juicy red tomatoes off their vines. Immediately, I became chartreuse with envy but quickly shrugged it off and stayed on task. Rising to the challenge, I lowered my shovel, confronted the bright green shrub and gave it a good yank. All of a sudden with a zip I flew onto my back, holding what seemed like a clump of mud. Desperately, I shook myself off trying to clean the dirt from my clothes without attracting too much attention to myself. Then, I stared at my fist and gasped. I ran over to Mrs. Benoit screaming, “ I think I just harvested turtle eggs!” She just laughed and said, “Honey, those are potatoes.” My eyes became as big as golf balls in sheer disbelief. I never looked at a potato the same way ever again. This is the best roast potato recipe ever. These little beauties are quite addictive, and they will disappear in mere moments. Breaking through these perfectly roasted potatoes, listening to the cartoon crunch, inhaling its meaty aromatics and allowing the creamy, fluffy insides of the potato fall on your tongue like warm, buttery clouds, makes every second spent cooking them, tending to them, worthwhile. Enjoy! Note: Parboiling the potatoes, adding them to hot fat and slightly crushing them after they have cooked ¾ of the way, helps create a fluffy, insanely crunchy roast potato. Also, you can substitute clarified butter or duck fat for the olive oil for a less healthy option. I won’t tell! 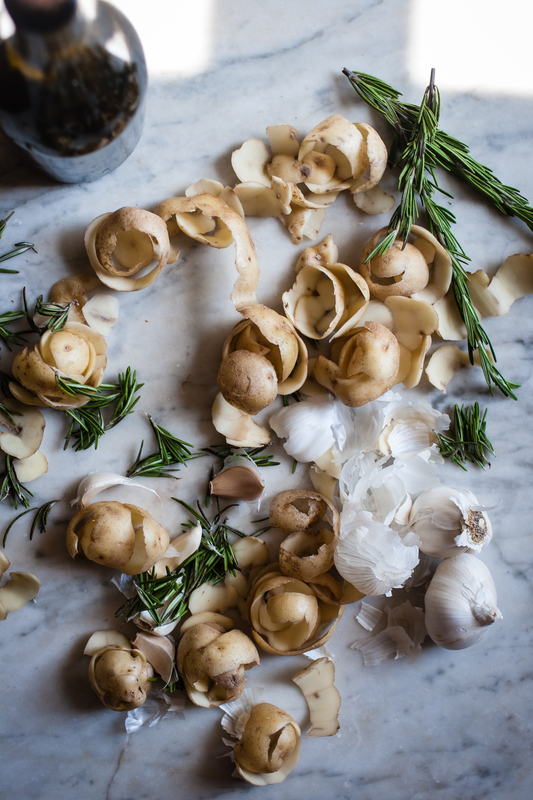 Crush the bulb of garlic, leaving the cloves in their paper jackets and pluck the leaves off of the rosemary sprigs. Place the potatoes into a pot of cold water, covering the potatoes by about 1-inch. Season the water with salt and boil for about 5 minutes. Drain and allow them to steam dry for a few minutes. Then, shake the colander until the potatoes start to look fuzzy and blurred around the edges. This step will help create a crunchy roast potato! Place a skillet on medium-high heat (or place in the preheated oven until hot) and add enough olive oil to coat the bottom of the pan. 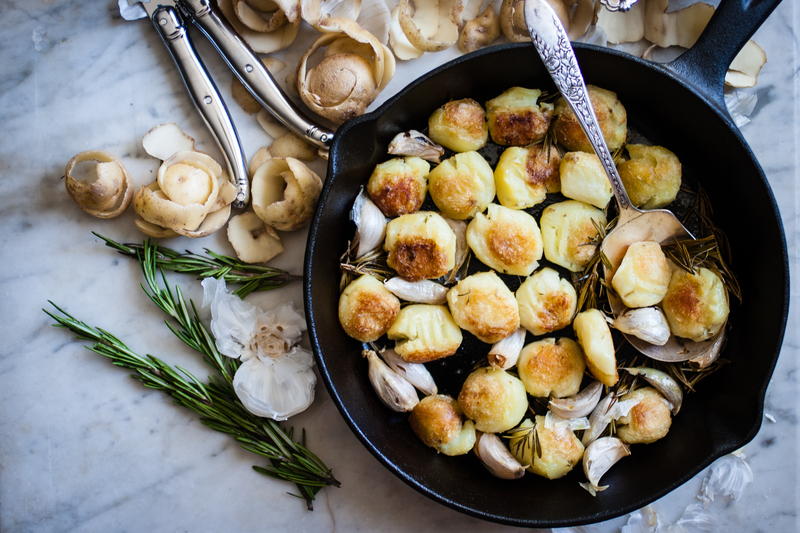 Toss in the garlic cloves, rosemary leaves and potatoes and place in the preheated oven for 30 minutes. After 30 minutes, take the skillet out of the oven, gently flip the potatoes and smash them slightly with the back of a fork. Place them back in the oven for 30 more minutes, or until the edges are crispy and golden brown. Serve immediately. After I took these photos I sat down to preview the shots, and luckily they came out great because before I knew it my husband had all of the potatoes in his plate and was going to town! So, this should feed 4 but it can also feed 1 or 2 greedy people! I adore each one of your stories.. Can’t wait to try this out. You are so sweet and such a Southern talent yourself! I have been making potatoes this way since the holidays, and I have felt quite selfish in not posting them until now… They are addictive. I hope you enjoy! 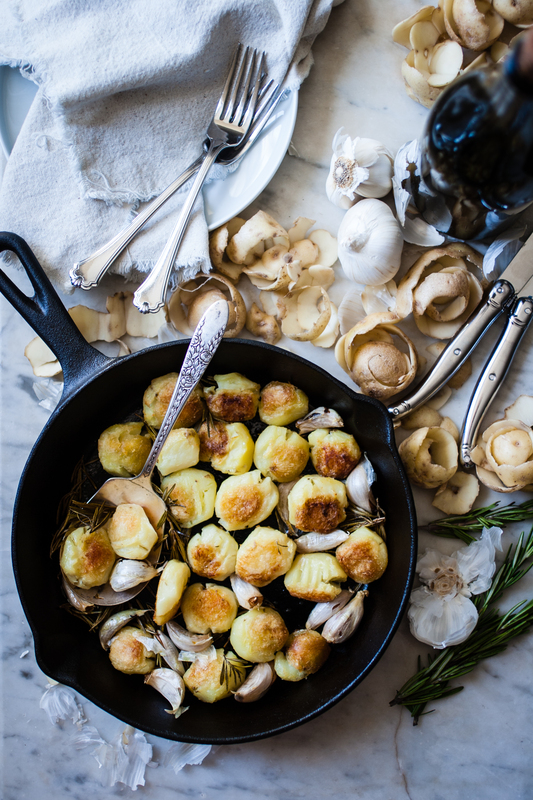 What a gorgeous post and lovely story to accompany the recipe. I’ve once tried the “Jamie Oliver method” for roast potatoes and I remember the potatoes turning out wonderfully crispy on the outside while staying soft and creamy in the inside. Thanks for sharing your recipe, Amber! Now I have a huge craving for roast potatoes. Would love to make them with duck fat! Thanks so much! I love watching his cooking shows during Christmas, and there was one episode in particular where he made these potatoes and whenever he cracked through the first layer of that cartoon crunchy exterior and revealed the fluffy, steamy insides… I was hooked! I’ve been making them this way ever since! And yes butter and duck fat are wonderful in this recipe as well! Yum! Yes, I agree that Jamie Oliver really has an inspirational style of cooking. These certainly DO look perfect. I love the recipe! You’re sweet! These potatoes are amazing! I did some digging to find the perfect roast potato recipe and this is the best! These potatoes look absolutely fantastic! I am seriously in love with them. This looks beautiful! I love your site so much! Thanks for the delicious recipe! Thanks for the kind words! I adore this recipe and it was such a pleasure sharing it with y’all! Thanks so much for the sweet words! I love how certain dishes or ingredients remind us of particular memories, and I am blessed to be able to share these moments with y’all! I can’t express how wonderful these little beaming beauties are… love! Beautiful words, gorgeous photos and to top it all a lovely recipe! Potato prepare at this way goes as perfect combination with some goat cheese!! Thanks so much! I never thought of serving this dish with goat cheese, but I’ll have to try it next time! Aw thanks so much! You are too sweet! I couldn’t stand not sharing these with y’all! just love how photogenic your potatoes are! They are stunners for sure! Even the peelings somehow came out looking lovely! Thank you! I am a potato and these look delicious. Thanks for sharing. I love your blog, I wish we had some southern restaurants here in Australia. I was looking for a recipe for your fried chicken, but couldn’t find it…. Thanks so much for the sweet words! I’m saving my fried chicken recipe for a special project! Oh,That sounds exciting. Is there somewhere else you can suggest I look for a good fried chicken recipe? Here are a few names of lovely Southerners (or publications) that I trust for a good fried chicken recipe: Virginia Willis, Southern Living, Martha Foose Hall, Tyler Florence, Donald Link, Hugh Acheson.